In his extremely thorough work on Isaiah, Robert Wilken brings to bear his considerable knowledge of early Christianity. Drawing on writings of the church fathers -- Eusebius of Caesarea, Ambrose, Jerome, Cyril of Alexandria, Theodoret of Cyrus, Bernard of Clairvaux, and nearly sixty others -- all of them masterfully translated, this work allows the complex words of Isaiah to come alive. 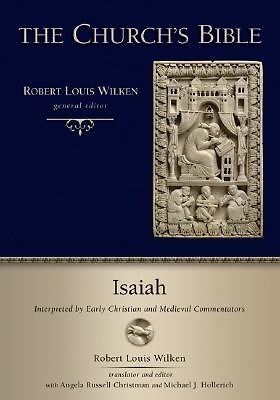 Wilken's selection of ancient commentators clearly illuminates how Isaiah was used by the New Testament writers and understood by the early church fathers. Each chapter begins with a modern English translation of the septuagint, prepared by Moises Silva. Editorial comments provide a foundation for understanding the excerpted commentaries and other writings that follow for each chapter. Isaiah: Interpreted by Early Christian and Medieval Commentators is ideal for devotional and spiritual reading and for a deeper understanding of the church's historical interpretation of this major prophet.